As Winston Churchill once stated, if you want to predict the future, study history. In nature there are natural rhythms and cycles. When looking at Tom Boonen and the history of Belgian racing it is reasonable to predict that he has a great future ahead of him. Since World War II Belgium has produced a truly great champion every decade. 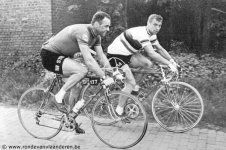 In the 1940's it was Brik Schotte, the 1950's Rik Van Steenbergen, the 1960's Rik Van Looy, the 1970's Eddy Merckx, the 1980's Freddy Maertens, the 1990's Johan Museeuw and possibly for the first decade of the 21 st Century it will be Tom Boonen. The common denominator with all of these riders is they were all World Road Race Champions. 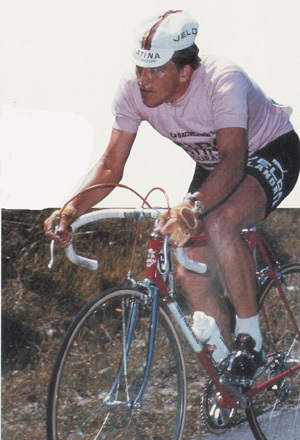 They also accumulated extensive wins in single day races and apart from Merckx were not viewed as stage race riders. When Tom Boonen crossed the line at this year's World Road Race Championships he immediately established his place in cycling history with a new unique achievement. He is the first rider to have won the World Championship Road Race, Tour of Flanders and Paris-Roubaix in one season. Naturally cycling crazy Belgium is ecstatic with this latest victory and as part of the recognition earned himself an audience with the King of Belgium. Now 24 years old, Tom first came into prominence during his first year as a professional. 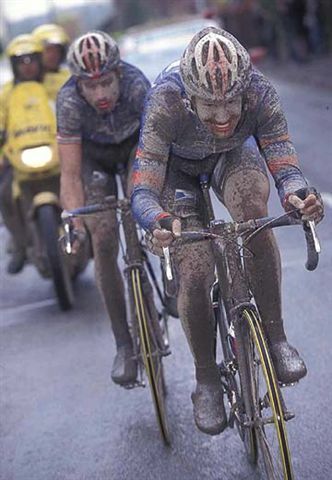 Many people will remember the image of Tom and George Hincapie late in Paris-Roubaix 2002 trying to chase down Johan Museeuw when suddenly George slipped from the slick cobbled road into a deep muddy ditch. Tom's instinct was to wait for his USPS teammate but was instructed to continue. As a result he finished an incredible third in his first attempt through the ‘Hell of the North' . 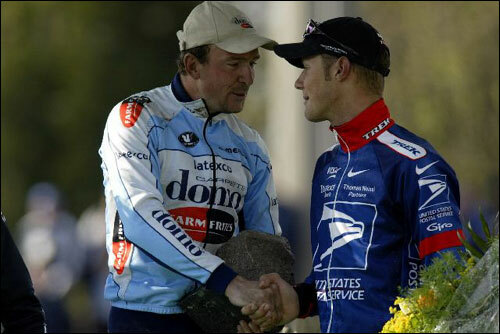 Recognizing Tom's potential, Johan Museeuw was instrumental in convincing Boonen to come across to his Quick.Step team. So following a sizeable buy-out of his contract with USPS, Boonen joined his childhood hero. However when the 2003 season turned out to be a disappointment, many thought that perhaps Boonen was just another shooting star. Fortunes began to turn as the 2004 season matured; it was becoming clear that in fact Tom was something special. He amassed 21 quality wins including two Tour de France stages, the Ghent-Wevelgem and the E3-prize Harelbeke. His second TdF stage win was the highly prestigious final stage into Paris . With this feat he matched Museeuw who had also won this stage some years earlier. With the retirement of Johan Museeuw all of Belgium was hungry for a successor. They wanted a new ‘Lion of Flanders' and Tom started to bear the burden with dramatically increased expectations. The Belgian fans did not have to wait long. The 2005 season produced ‘only' 14 wins but the results reflect quality over quantity. In January he started his spring campaign in the desert of Qatar where he won two stages. Back home during February and in snowy conditions he took out the bunch sprint, following the lone victory of his teammate Nick Nuyens, in the highly coveted Omloop Het Volk. In March came a frigid Paris-Nice and two stage wins, and later that month victory in the E3-prize Harelbeke. Tom was in great form. April is the high point of the early season one day races. At the beginning of the month the Tour of Flanders rivets the attention of the Belgian people. In terms of status most of the Belgian fans rank it more important than the World Championships. In an audacious solo break 9km from the finish, Tom powered away to a magnificent solo win. The Belgians had found their new ‘Lion of Flanders'. But more was to come. Just seven days later in Paris-Roubaix Boonen was the driving force that decided the final selection. On the outskirts of Roubaix , and with just three sectors of brutal cobbles to go, Tom put it into overdrive. George Hincapie (Discovery) and Juan Antonio Flecha (Fassa Bortolo) were the only riders left capable of hanging on. On the velodrome in Roubaix Boonen made no mistake with the sprint for the line. He thus became only the eighth rider in history to do the Flanders-Roubaix double. In July two early Tour de France stage wins seem to be setting Tom up well for the Green Points Jersey. However injury eventually forced him to retire. At this point 2005 had already been a dream season but quietly Tom started to prepare for the World's. The rest is now history. In 1967 I was racing in Belgium and remember very clearly a conversation that I had with some race fans while we were lining up for the start of a race on the outskirts of Ghent. These fans were bemoaning the demise of cycle racing and convinced that it would be extinct within a few years. Their memories were of the golden days of Brik Schotte, Rik Van Steenbergen, Stan Ockers and the soon to retire Rik Van Looy. No longer did the Belgian racers electrify the fans and bring them out in droves. Crowds were evaporating and sponsors were going elsewhere. Looking back on that day it is strange because at that very point in time the future greatest cyclist ever was just getting into his stride. Eddy Merckx's voracious appetite was already starting to devour race after race. The ‘Belgian cycle' was again on the upswing. It now looks as though the natural forces of nature and the flow of history are once more nurturing a great Belgian champion in the form of Tom Boonen.